For ten days in January, Utah plays host to hundreds of ground-breaking filmmakers and artists, as well as thousands of industry and film lovers. And with the 2018 Sundance Film Festival just around the corner, the host state’s Film Commission shares its top picks for every audience. “To have this kind of event in our state year after year is incredibly rare and we like to encourage locals to fully embrace the Festival experience and take advantage of all it has to offer”, says Virginia Pearce, director of the Utah Film Commission. For those who haven’t attended the annual Festival previously, choosing a film to watch or even thinking about how and where to access the Festival may seem daunting. With a number of world premieres and special events planned, these are just some of the anticipated highlights in store for 2018. Programmed in cooperation with the Utah Film Center, the ‘Kids’ category is intended to appeal to the youngest independent film fans. This year’s line-up includes Lu Over the Wall (Japan), Science Fair (USA) and White Fang (France, Luxemburg, USA). Catch the World Premiere of the made-in-Utah documentary, Quiet Heroes, directed and produced by Utah’s own Jenny Mackenzie. Set in Salt Lake City, the documentary sheds light on the AIDS crisis, where patients across the entire state and intermountain region relied on only one doctor. The World Cinema Documentary Competition includes twelve documentaries by some of the most courageous and extraordinary international filmmakers. A Polar Year (France) tells the story of Anders, who leaves his native Denmark for a teaching position in rural Greenland and finds himself at odds with the locals. And This Is Home (USA, Jordan) offers a portrait of four Syrian families arriving in Baltimore, trying to find their footing to rebuild their lives. The Documentary Premieres section offers content from renowned filmmakers about far-reaching subjects. The Festival’s Salt Lake Opening Night film, Won’t You Be My Neighbor, explores the impact of the iconic Fred Rogers. The ‘NEXT’ section offers innovative, creative storytelling paired with digital technology. 306 Hollywood (USA, Hungary) follows two siblings in search of what life remains in the objects we eventually leave behind. If you need a break from movie-watching, the annual ‘Utah Film Commission on Main’ venue [625 Main Street] will be open for snacks, internet access and ongoing events and activities throughout the Festival, with its doors open to the public from 10AM to 4PM, January 19-25. Visit film.utah.gov for more details. Copper Common, downtown Salt Lake, is hosting a nightly Festival Lounge for over 21s. Drop by for live music and to discuss the films you’ve seen with fellow film lovers. Salt Lake’s Rose Wagner Center will also be hosting the Festival Lounge at the Rose from 6pm-11pm, January 25-27. Once the Festival ends, Sundance Institute presents complimentary screenings of award-winning ‘Best of Fest’ films to Locals in Salt Lake, Park City and Sundance Mountain Resort. Screenings are free and tickets can be picked up on a first-come, first-served basis from all main box offices on January 13. ‘Townie Tuesday’ screenings for Summit County residents can be collected the same day. Make sure to leave extra time to get where you’re headed. Traffic in Park City during the Festival can be challenging. If you’re traveling from Salt Lake to Park City, take advantage of special festival-goer parking lots to leave your car and use the Festival’s free shuttle system. The Richardson Flat Park & Ride is free, open from 7:00am – 2:30am, with shuttles running every 10 minutes. Check out this guide on how to get around. No more waiting in long lines prior to screening time! This is a great way to see sought-after films as the Festival likes to ensure that every seat in every theatre is taken. At the start of each film, any open seats are sold to people who have signed up to the eWaitlist. 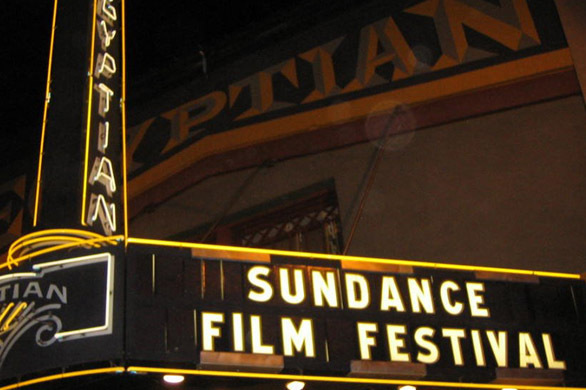 Just register for an account through the Sundance 2018 app or website, and select a film starting 2 hours before its show time to receive your eWaitlist number. You can then show up at the venue at least 30 minutes before the screening for a good chance of getting a seat for $20. It’s a great way to see films without any tickets listed as available.